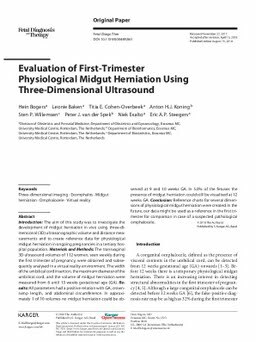 Introduction: The aim of this study was to investigate the development of midgut herniation in vivo using three-dimensional (3D) ultrasonographic volume and distance measurements and to create reference data for physiological midgut herniation in ongoing pregnancies in a tertiary hospital population. Materials and Methods: The transvaginal 3D ultrasound volumes of 112 women, seen weekly during the first trimester of pregnancy, were obtained and subsequently analysed in a virtual reality environment. The width of the umbilical cord insertion, the maximum diameter of the umbilical cord, and the volume of midgut herniation were measured from 6 until 13 weeks gestational age (GA). Results: All parameters had a positive relation with GA, crown-rump length, and abdominal circumference. In approximately 1 of 10 volumes no midgut herniation could be observed at 9 and 10 weeks GA. In 5.0% of the fetuses the presence of midgut herniation could still be visualised at 12 weeks GA. Conclusion: Reference charts for several dimensions of physiological midgut herniation were created. In the future, our data might be used as a reference in the first trimester for comparison in case of a suspected pathological omphalocele.